Business-to-business (B2B) marketers' confidence in content marketing continues to grow; content marketing usage rates are up from last year; and, not surprisingly, marketers with a documented content strategy are having the greatest success, according to just-released research. The report, B2B Content Marketing: 2014 Benchmarks, Budgets and Trends—North America (PDF), is published by MarketingProfs and the Content Marketing Institute, and sponsored by Brightcove. 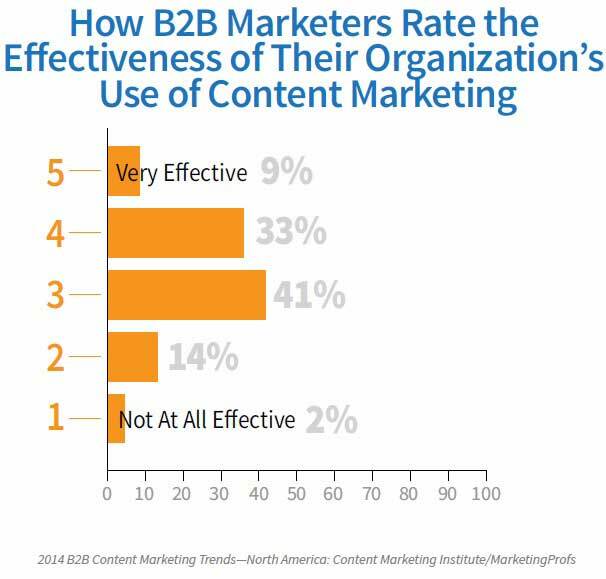 Some 93% of B2B marketers in North America are using content marketing, and, of those, 42% consider themselves effective at content marketing, up from 36% last year, the study found.